Heat oven to 325°F. Generously grease 12-cup fluted tube cake pan with shortening or cooking spray. Make cake mix as directed on box, using water, oil and egg whites. Divide batter among 3 small bowls. Add few drops yellow food color to 1 bowl; mix well. Add red food color to second bowl to make pink. Add red and blue food color to third bowl to make purple. Pour half of the yellow batter into cake pan. Carefully pour half of the pink batter over yellow batter. Carefully pour half of the purple batter over pink batter. Repeat layers (do not mix colors). Bake as directed on box until toothpick inserted near center comes out clean. Cool 10 minutes; remove from pan to cooling rack. Cool completely, about 1 hour. Place cake on serving plate. Divide frosting among 3 small microwavable bowls. Microwave 1 bowl on High about 5 to 10 seconds; add few drops yellow food color and stir until frosting is smooth enough to drizzle. With spoon, drizzle yellow frosting back and forth over cake in striping pattern until all frosting is used (allow some frosting to drip down onto plate in middle of cake, if desired). Microwave second bowl of frosting; add red and blue food color to make purple. Drizzle frosting over cake in same striping pattern. Repeat with last bowl, adding red food color to make pink frosting. Decorate cake with sprinkles. 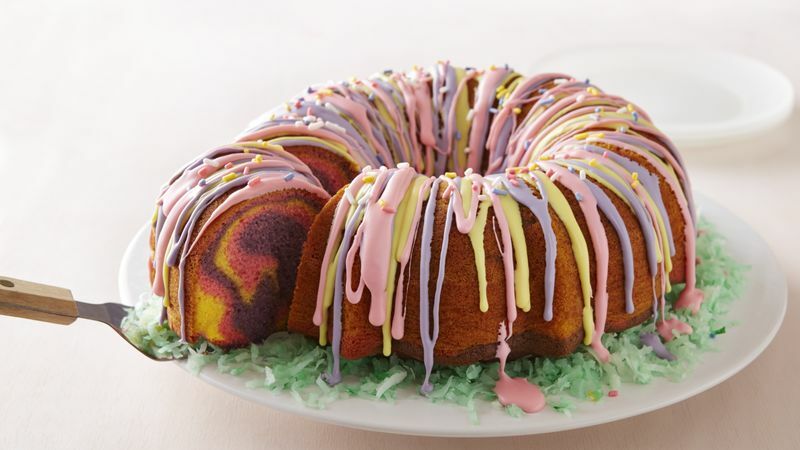 Add jelly beans or your favorite Easter candy to the center of the cake for added decoration. Experiment with tinting the batter and frosting with different food colors. Pale blue looks nice too. When adding the batter to the cake pan, don’t mix the colors—just pour them on top of each other.